Hello! This is my very special three month old Rex. I'm a great dog lover and have never been without at least one dog in my home as far back as I can remember. But now as my own children are grown, finishing up college, and planning on taking their dogs when they move out, the idea of even one day without a dog nearby was beginning to weigh heavy on my heart. Then much to my delight, my husband agreed to let me get a puppy for Christmas (to help ease the coming empty nest syndrome) I must say I never expected the instant bond that came with the realization that this was my very own dog. He is not the family dog, not my room mates, not the children's, but mine. I can love him and praise him and walk him and spoil him all I want. I can let him on the bed, give him treats just because, and have him with me all the time. He is very smart, affectionate, energetic, strong and protective even at this very young age. I finally have everything I ever wanted in a dog and it only took me 52 years! 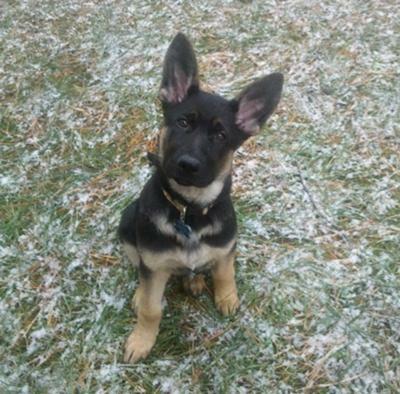 Jody, Thanks for posting your great story about your German Shepherd puppy Rex. Beautiful boy and those beautiful ears!